Notes: Moher Tower is the stone ruin of an old watchtower which stands on Hag's Head, at the southern end of the Cliffs of Moher, located in County Clare, Ireland.The building is a single, nearly square, tower with two rectilinear bartizans protruding from the top of its eastern wall, and one from the western wall, which faces the Atlantic Ocean. The original structure appears to have incorporated a fireplace on at least 2 floors, and a dry stone roof which has since mostly caved in. The roof itself has a short parapet which appears to have been more for protection from falling than to have served any defensive purpose. In summer the tower ruin is occupied by the many choughs and similar birds native to the area. 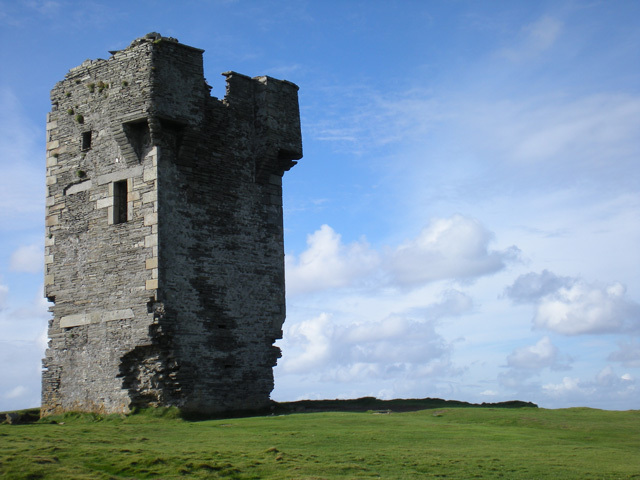 The tower is sometimes used as a refuge by visitors to the Cliffs of Moher who become stranded on the southern cliff path during storms that whip in off the Atlantic.